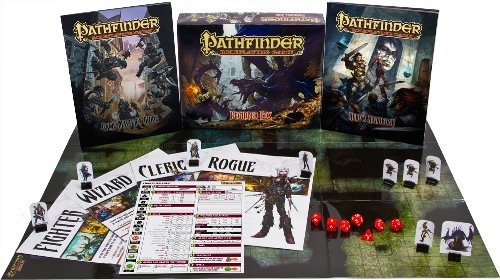 Starting Spring 2013, the Guild has been using full Pathfinder rules and character options! For resources for Beginner Box play, click here. Here are the steps. You may also want to download the Character Creation Guide if you like to have all the basics in one place. Choose your RACE. Apply your racial modifiers to your 6 ability scores. Choose your CLASS(ES). (All 31 Pathfinder classes are available!) First-level characters only have one class — you can multi-class when you level-up, “stacking” one or more classes over your previous ones. You can choose archetypes (specialized versions within each class) as well. PRESTIGE CLASSES have specific requirements before you can take levels in them. NOTE FOR HIGH-LEVEL CHARACTERS: Your character MUST have been able to be “built up” level by level! For example, if a Prestige Class requires that you have 5 ranks in Diplomacy, you cannot create a 5th level character with that Prestige Class because that required taking five levels BEFORE you took the Prestige Class. This rule applies to many feats and ALL things that have requirements. When you level up, you do things in this order: (1) choose your class level, (2) increase an ability score +1 at Level 4/8/12/16/20, (3) add new class abilities, and (4) add skills and feats. List your racial features and class features on your character sheet. Choose your Feats. We will not use Traits. Remember that some feats have prerequisites. See list of Core Rulebook feats. If you want to see EVERYTHING, see the full gigantic list of feats! Check-off your class skills. Spend your skill ranks. Add everything up: hit points, saving throws, Armor Class, etc. Check-in at the Pathfinder Lodge! Give a character bio and picture to the Grandmaster to get your character on the website! This has the Core Rulebook and the Bestiary: these form the Core Rules. It also includes these expansions: Advanced Player’s Guide, Ultimate Magic, Ultimate Combat, Advanced Race Guide, Gamemastery Guide, and Bestiaries 2 and 3. This organizes everything, including archetypes, by class and race. Useful if you want to just look at one class’s options at a time. Who is this? Is it Mr. Roberts? Hm, put up a different link, it should work now. Not for Guild characters. It violates the overall rule that you can only have 1 extra creature and it must come from a class ability. Guildmoor characters can, however, if they ever level up that far.